FIRST MAN. (DVD Artwork). ©Universal Home Entertainment. 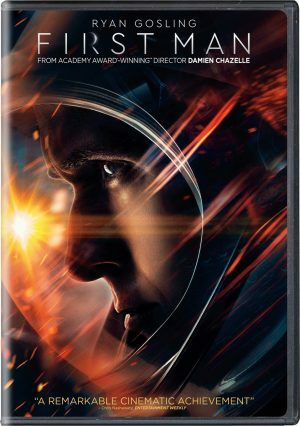 Follow the true story of the first manned mission to the moon in “First Man,” arriving on 4K Ultra HD, Blu-ray, DVD and On Demand Tuesday Jan. 22, from Universal Pictures Starring Ryan Gosling (“La La Land,” “The Big Short”) as astronaut Neil Armstrong, the film already is available on Digital and via the digital movie app Movies Anywhere and on Home Entertainment. “First Man” comes from acclaimed Oscar-winning director Damien Chazelle (“La La Land,” “Whiplash”) who directed Gosling in “La La Land.” Gosling plays the low-key, pioneering space explorer and Claire Foy (“The Crown,” “Breathe”) portrays his wife Janet, in the heroic and emotionally driven journey through a pivotal moment in the history of mankind. The critically acclaimed film is packed with bonus features including deleted scenes and special featurettes showing behind-the-scenes looks at creating the film. Based on the book “First Man: The Life of Neil A. Armstrong,” by James R. Hansen, “First Man” tells the story of the first manned mission to the moon, focusing on Armstrong and the decade leading to the historic Apollo 11 flight. A visceral and intimate account told from Armstrong’s perspective, the film explores the triumphs and the cost—on Armstrong, his family, his colleagues and the nation itself—of one of the most dangerous missions in history. The film is executive produced by Steven Spielberg (“Jurassic World: Fallen Kingdom,” “Schindler’s List”) alongside fellow executive producers Adam Merims (“Baby Driver,” “Straight Outta Compton”) and Josh Singer (“The Post,” “Spotlight”) with a screenplay by Singer. The supporting cast includes Kyle Chandler (“The Wolf of Wall Street,” “Friday Night Lights”), Jason Clarke (“Zero Dark Thirty,” “Mudbound”), Corey Stoll (“The Strain,” “House of Cards”), Pablo Schreiber (“Skyscraper,” “Orange is the New Black”), Christopher Abbot (“The Sinner,” “Whiskey Tango Foxtrot”) and Ciaran Hinds (“Game of Thrones,” “Tinker Tailor Solider Spy”). “Here and Now” arrives on DVD Tuesday Jan. 22, from Paramount Home Media Distribution. The drama marks the theatrical feature debut of director Fabien Constant (“Mademoiselle C”). The film was written by Laura Eason (“House of Cards”). The DVD includes the film in standard definition, as well as the featurette “Here and Now: A Diagnosis of Story,” in which Parker, Common and the cast and crew discuss the story and making of the film. Sony Pictures Home Entertainment has unleashed “Goosebumps 2” on Digital and via the Movies Anywhere App as well as Blu-ray and DVD. Slappy, the devious ventriloquist dummy, returns to run amuck, in this second installment of the family-friendly franchise based on R.L. Stine’s beloved book series. Standing in Slappy’s way is a terrifyingly talented cast including Wendi McLendon-Covey (“The Goldbergs”), Madison Iseman (“Jumanji: Welcome to the Jungle”), Jeremy Ray Taylor (“It)”, Caleel Harris (“Castle Rock”), and Chris Parnell (“Rick and Morty”), with Ken Jeong (“Crazy Rich Asians”). The U.K.’s official submission for Best Foreign Film in this year’s Academy Awards, “I Am Not a Witch,” from the Zambian-born Welsh director Rungano Nyoni, arrives on DVD and Digital Tuesday Jan. 22. The film is a striking satire about witchcraft in contemporary Zambia. When nine-year-old Shula is accused of witchcraft, she is exiled to a witch camp run by Mr. Banda, a corrupt and inept government official. Tied to the ground by a white ribbon, Shula is told that she will turn into a goat if she tries to escape. As the only child witch, Shula quickly becomes a local star and the adults around her exploit her supposed powers for financial gain. Soon she is forced to make a difficult decision—whether to resign herself to life on the camp, or take a risk for freedom. At times moving, often funny and occasionally surreal, “I Am Not a Witch” offers spellbinding storytelling with flashes of anarchic humor, showcasing Nyoni as the birth of a significant new screen voice. Rowan Atkinson (“Mr. Bean”) returns as the much-loved accidental secret agent in the third installment of the action-packed spy comedy franchise, “Johnny English Strikes Again,” arriving on Blu-ray, DVD and On Demand Tuesday Jan. 22, from Universal Pictures Home Entertainment. It also is now available on Digital. Johnny English and his sidekick, Bough, are back in this hysterical comedy filled with even more action and more laughs for the whole family to enjoy. From one of Britain’s leading comedy directors David Kerr (“Inside Number 9”), the film boasts an all-star cast including Ben Miller (“Paddington 2”), Olga Kurylenko (“Quantum of Solace”), Jake Lacy (“Carol”) and Emma Thompson (“Saving Mr. Banks”). Loaded with more than 30 minutes of exclusive bonus features, “Johnny English Strikes Again” on Blu-ray, DVD and Digital include an up-close look at the carefully selected film locations and detailed sets as well as Johnny’s notable collection of gadgets and cars, along with a breakdown of the extraordinary cast, diving deeper into the legacy of everyone’s favorite hapless spy. From the duo that brought audiences “The Room” and inspired “The Disaster Artist” comes the compelling two-part series “Best Friends Volumes 1 & 2,” available together on Blu-ray (plus Digital) Tuesday Jan. 22 from Lionsgate. “Best Friends Volume 1” is currently available worldwide on Digital and On Demand and “Best Friends Volume 2” will be available for the first time worldwide on Digital and On Demand also on Jan. 22. Tommy Wiseau and Greg Sestero play unlikely friends torn apart by greed, hatred, jealousy, and gold teeth with devastating and mysterious consequences. The “Best Friends Volumes 1 & 2” Blu-ray includes an audio commentary with Wiseau and Sestero, three featurettes, and eight deleted scenes, and will be available for the suggested retail price (SRP) of $21.99. The third season of the heartwarming family comedy Fuller House is set for release on DVD, Tuesday Jan. 22, from Warner Bros. Home Entertainment. One of television’s most beloved families is back to entertain viewers with 18 hilarious new episodes, featuring guest appearances by original “Full House” cast including Bob Saget (“Full House,” “Entourage”), Lori Loughlin (“Full House,” “When Calls the Heart”), John Stamos (“Full House,” “Grandfathered”) and Dave Coulier (“Full House,” “Robot Chicken”). Get ready for more laughter and good times as the Tanners, Fullers and Gibblers embark on a brand-new set of entertaining adventures. “Fuller House: The Complete Third Season,” will retail for $24.98 (SRP). The third season of “Fuller House” will also be available to own on Digital via purchase from digital retailers. “Fuller House” is the continuation of the ‘90s ABC series “Full House” in which eldest daughter D.J. Tanner (Candace Cameron Bure, “Full House,” “A Christmas Detour”) is now a veterinarian and recently widowed mother trying to raise three boys on her own. She is joined by her sister Stephanie (Jodie Sweetin, “Full House,” “Walt Before Mickey”) and best friend Kimmy Gibbler (Andrea Barber, “Full House,” “The Skateboard Kid 2”) and Kimmy’s teenage daughter Ramona (Soni Bringas), who move in to lend their support and help raise D.J.’s kids. Steve and C.J. make plans to get married in Japan and the gang heads overseas for the big wedding, but before anyone has a chance to say “I do,” a big revelation has an impact on the nuptials. Plus, Stephanie makes plans to get in-vitro fertilization, D.J. tries to get Tommy into a prestigious preschool, and Fernando buys Kimmy’s childhood home and restores it to its former glory. Meanwhile, Jackson and Ramona start high school where Ramona tries out for her school’s dance team while Jackson becomes a joke at his school after slipping on a piece of bologna during lunch. Joey, Jesse and Danny come home to celebrate 30 years since they initially moved in together to raise the Tanner girls. It’s an unforgettable season filled with laughter and love for the Tanners and their friends on this beloved family comedy. The series, which has earned a Primetime Emmy Award nomination for Outstanding Children’s Program, has already been renewed for a fourth season on Netflix. Front Row Features has plenty of giveaways this week to keep movie fans entertained in 2019. Not only are we giving away a copy of the Oscar hopeful “First Man” on Blu-ray/DVD Combo Pack to one lucky reader, but we are also giving away a copy of Sarah Jessica Parker’s new drama “Here and Now” on DVD to two lucky readers and a copy of the action-packed family comedy “Johnny English Strikes Again” on Blu-ray/DVD Combo Pack to three lucky readers. To enter the contests, simply email socalmovieeditor@aol.com by Jan. 29 with the title of which movie you want to win in the subject line. Good luck! Next PostPhotos: ‘First Man,’ ‘Fuller House,’ More on Home Entertainment … Plus Giveaways!! !